A tropical plant species could revolutionise the way wastewater is cleaned and managed in the developing world, field research has shown. A visiting Danish biologist with the University of Western Australia has spent several months in Thailand conducting experiments on the tropical plant species Job's Tears (Coix lacryma-jobi L.) by growing it in various wastewater solutions to assess its suitability to grow in and filter constructed wetland systems. Developing countries such as Thailand and Vietnam often pump untreated wastewater into their waterways causing a serious disease threat to human health such as the spread of E.coli bacteria. Study co-author Dennis Konnerup says water treated using C. lacryma-jobi can be safely used for irrigation or returned to waterways such as rivers and the sea. "Treating wastewater by using a native plant species is particularly relevant for developing countries such as Thailand as it is low tech, low energy, cost-effective and has potential on a large scale," Dr Konnerup says. "[We] investigated the growth of C. lacryma-jobi and its capacity to take up nitrogen and nutrients under differing pH conditions in a constructed wetland system." Dr Konnerup says the plant proved extremely efficient in removing nitrogen from polluted water. Research also found C. lacryma-jobi absorbs nitrogen especially well in the form of nitrates (NO3-) from wastewater. 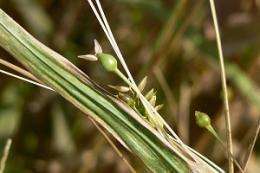 Job's Tears is a tall grain-bearing plant of the family Poaceae (grass family) native to Southeast Asia and is also known as Chinese Pearl Barley. Dr Konnerup says it has been used for wastewater treatment in China but limited knowledge of the eco-physiology of the plant exists. Seedlings were planted in different nitrogen based solutions consisting of either ammonium (NH4+) or nitrate (NO3-) and at four levels of pH: 3.5, 5.0, 6.5 and 8.5. After a 40 day period the growth rate (plant tissue analysis) for each individual plant was calculated. The plant species demonstrated higher growth rates due to its preference of NO3- nutrition, says Dr Konnerup. "We recorded nitrates being absorbed within days," he says. The plant also favoured water-saturated soils. Increased growth rate of C. lacryma-jobi was evident in slightly acidic conditions (pH 5-6.5). Warm climatic conditions aided the bacterial breakdown of solid masses allowing for fast uptake of nitrates. "This is particularly important in vertical flow systems," Dr Konnerup says. Dr Konnerup is also involved in researching the potential for growing ornamental flowers in constructed wetland systems.